I am building small bodied steel string guitars based on my Blues Buddy body shape. You could think of them as the Delta Blues Buddy, or not. These guitars are approximately a 000 size body. They are available with the 24.9″ 000 scale length or a 25.7″ scale length. 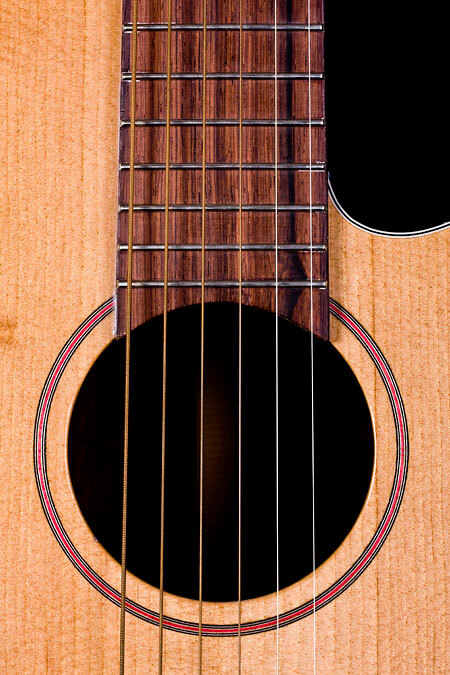 Standard woods are Indian Rosewood back and sides, Sitka or Engelmann spruce top, and mahogany or Cuban cedar neck. Other woods and scale lengths are available by arrangement. 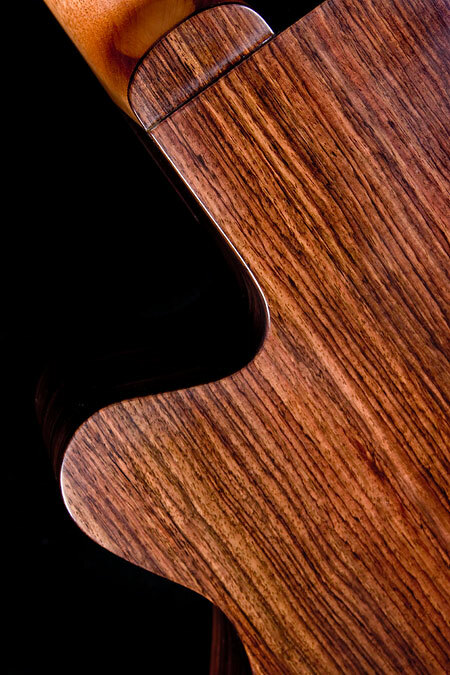 WOODS: Standard backs and sides are made from Indian rosewood. Necks are mahogany or Cuban cedar. 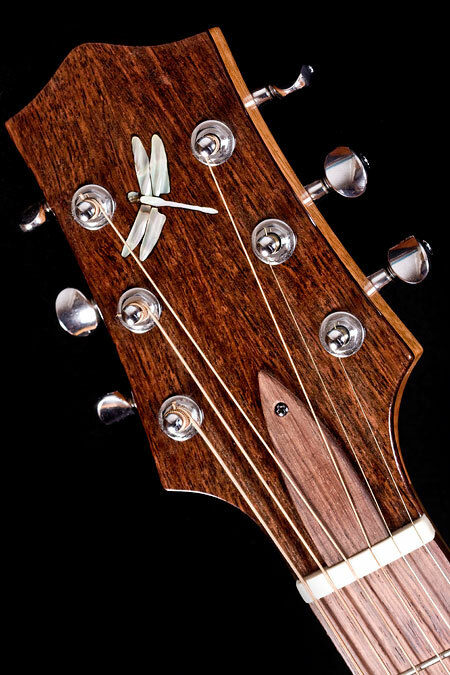 Bridge, fingerboard, and head stock face overlay are all rosewood. Tops are available in Sitka, Engelmann, and Blue spruce. STRUCTURAL DETAILS: An adjustable two way steel truss rod and carbon fiber reinforcement is standard. Standard scale lengths are 24.9″ or 25.7”. The standard top bracing pattern is an x-brace with finger braces, but other bracing schemes are available as an option. 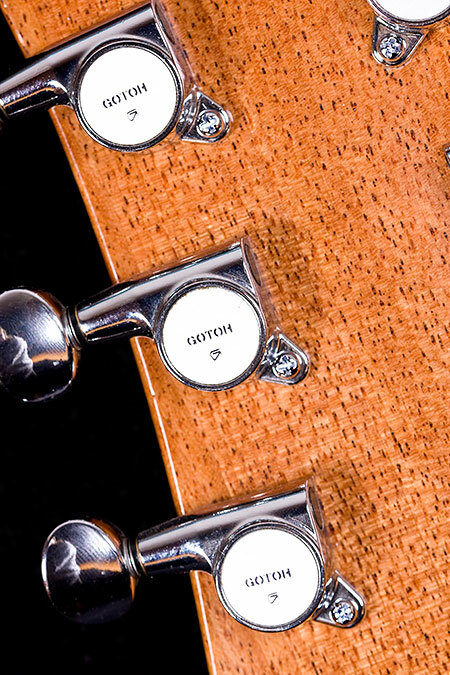 FINISHING: Standard tuning machines are chrome Gotoh with metal knobs. Standard binding is single layer ivoroid or single layer wood. The standard finish is clear nitrocellulose lacquer. Side marker dots are the only standard position markers. Abalone or MOP (mother of pearl) fingerboard inlays are available as an option. I am also building a hybrid version of the Delta Blues Buddy using a flat top and a carved back. These guitars offer yet another tonal color and response characteristic to the guitarist. 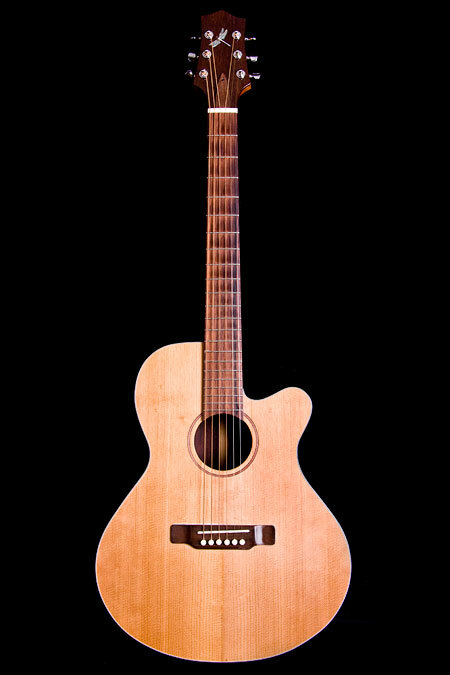 WOODS: The standard woods for these guitars consists of maple back, sides and neck with a Sitka spruce top. Bridge, fingerboard and headplate are all ebony, with rosewood optionally available. STRUCTURAL DETAILS:An adjustable two way steel truss rod and carbon fiber reinforcement is standard. Standard scale lengths are 24.9″ or 25.7”. 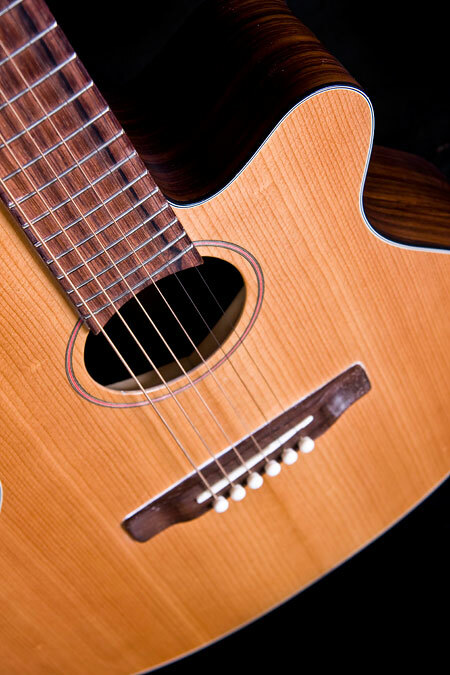 The standard bracing is x-bracing with fingers, the same as the Delta Blues Buddy. Optionally available is a ladder braced version with a floating bridge. This is conceptually similar to the Selmer style guitars. This small steel string is based on the Blues Buddy archtop. 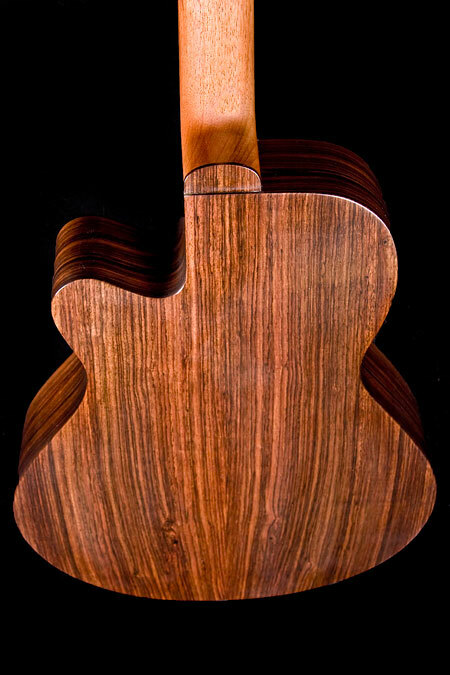 The top came from a chunk of Sitka floating around the shop — not enough for an archtop but ideal for a couple of flattops. It's a nice little guitar and records really well. It's a rosewood-fest — back and sides are Indian, bridge and peghead overlay are Brazilian, and the fretboard is Madagascar. Neck is Cuban cedar. 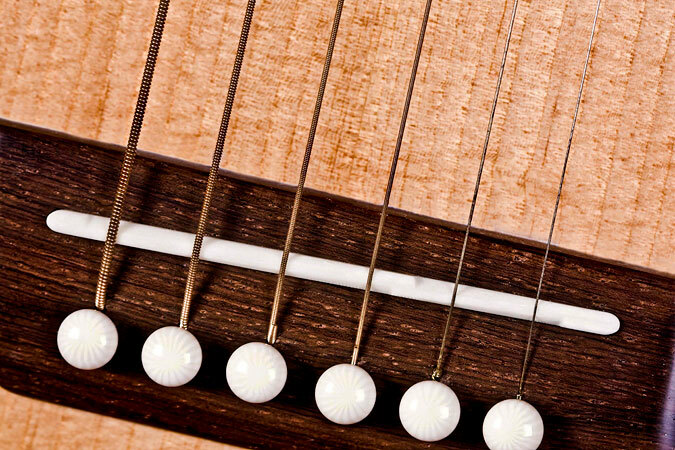 The guitar is X-braced with a non-Martin finger brace layout — 24.9" scale, with a double action trussrod. No pickup ... yet!